All framed art ordered from UrbanLoftArt.com comes with the framed piece as well as a bracket screwed into the frame and an additional bracket taped to the frame. 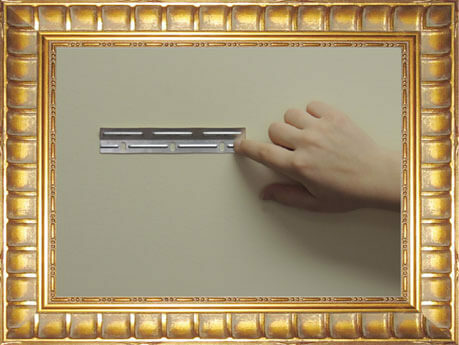 These included brackets will supply the best hold and support for the framed piece. 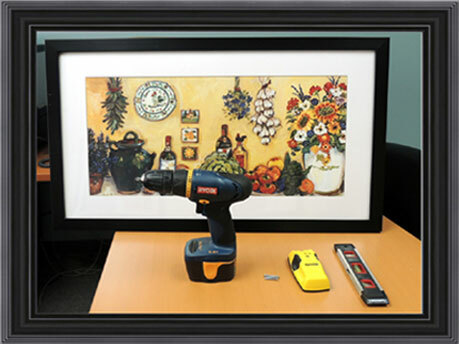 This method of hanging frames ensures that the framed piece will not shift once it is hung. Find out how to hang canvas art by clicking here! 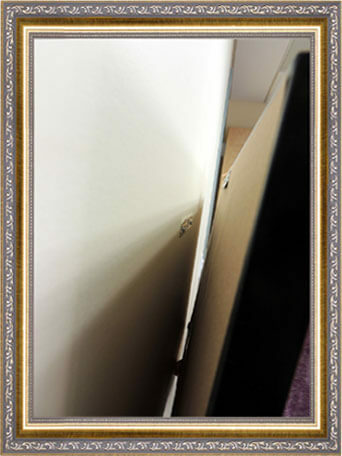 Our framed artwork is shipped in a flat box. 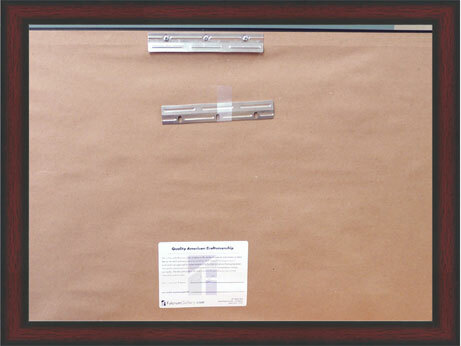 The framed piece with a bracket secured to the back as well as an additional bracket is included in the box. 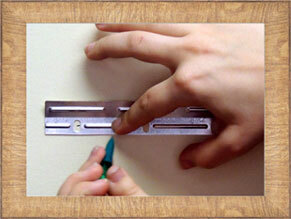 The additional bracket should be taped to the back, this is the bracket that you will need to secure into the wall. 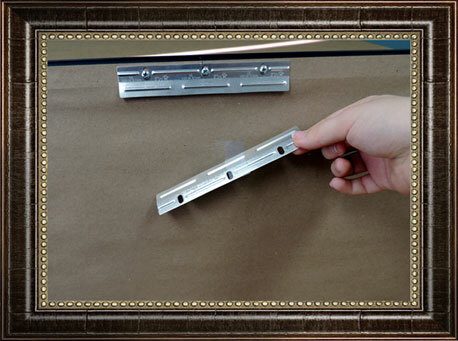 For larger framed art, two brackets will be attached to the back of your piece and two to hang your framed art will be taped to the back. This step is best to do before you buy the framed piece. 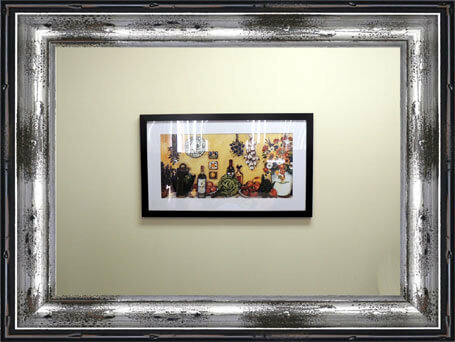 Find a place on the wall where you would like to hang the framed art. 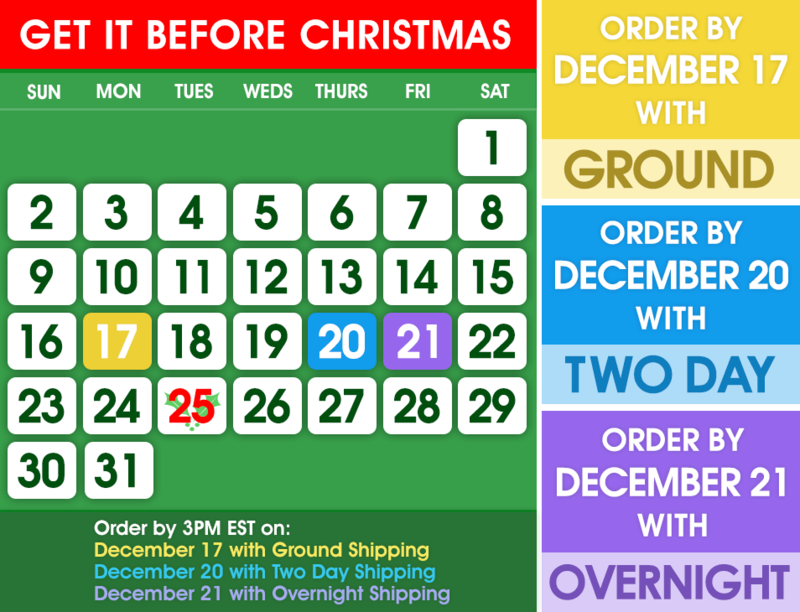 This has a better outcome when it is done before buying the frame that way you know how much space you have and you can shop for framed art by size. If you bought the frame before you mapped out where it will go, find a space in the room based on size and lighting. You do not want to place a large framed piece in a small space because it will take over and overpower the room rather than compliment it. You also want to make sure you are not placing a small piece in a large space, it will be more likely to go unnoticed. 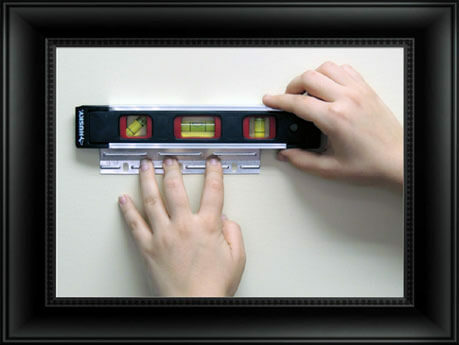 Another way to find a space on the wall to hang the frame is by using a stud finder. Stud finders help find the studs in the wall so you can fasten the bracket in that area. 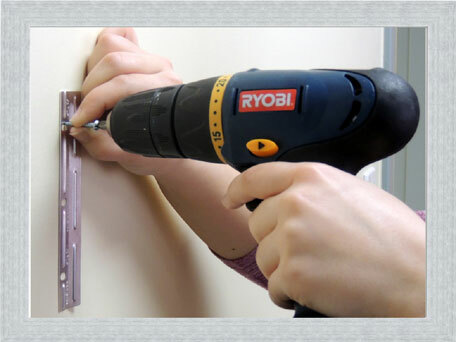 Fastening screws into the wall where a stud is supplies more support for the framed piece rather than fastening the bracket into a part of the wall that is just the wall and no stud. Look at the back of the frame, there should be one silver bracket screwed into the frame and one taped to the frame. 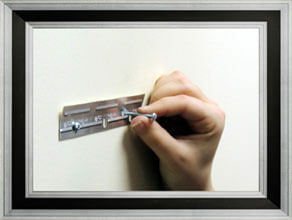 Carefully remove the taped bracket from the back of the frame. You can discard the tape. This bracket that you removed will need to be fastened into the wall with screws. Find the spot where you mapped out to hang the frame and hold the bracket up in that spot. Make sure the part of the bracket that has the holes is flush against the wall. Also, the part of the bracket that is elevated should be facing up and away from the wall. Continue to hold the bracket against the wall. Place the level on top of the bracket, for the most accurate results, make sure it is sitting directly on top of the bracket. Make necessary adjustments to the bracket until the level shows that it is even. Once the bracket is perfectly straight, you can remove the level but continue to hold the level in place. Using a writing utensil, mark inside the three holes of the bracket. You can use any writing utensil you have, these marks will be covered by the screws and frame so they will not be seen once the frame is hanging. Once you have all three holes marked, you can remove the bracket from the wall. 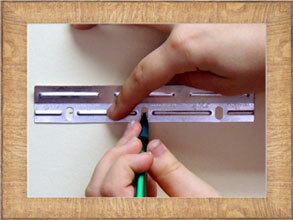 To ensure the frame will hang perfectly straight, you can align the level up with the three marks you have made. Once you have your marks aligned, take the bracket and line up the first hole of the bracket with the first of the three marks. Take your first screw and line it up with the bracket hole and mark on the wall. Once the screw is lined up with the mark, you no longer have to hold the bracket and can let it hang from the screw. Continue to hold the screw in place. 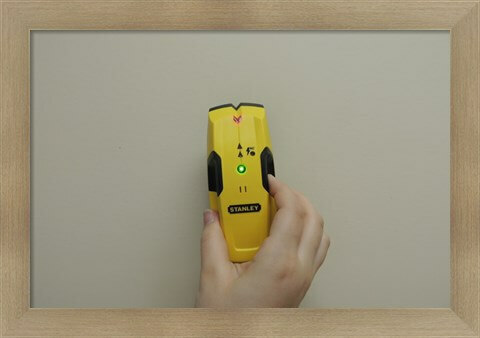 Using a hand held or electronic screwdriver, fasten the first screw into the wall. For best end results, do not fasten the screws all the way in until all screws are in place. This allows room for any necessary adjustments. Line up the last hole of the bracket with the third mark on the wall. Take a second screw and secure it almost all the way into the wall. The second hole should line up to the second mark on the wall. If it does not, adjust it so the last screw can line up to the mark and the hole. Once all of the screws are in place, go back and tighten them all the way into the wall using the screwdriver. 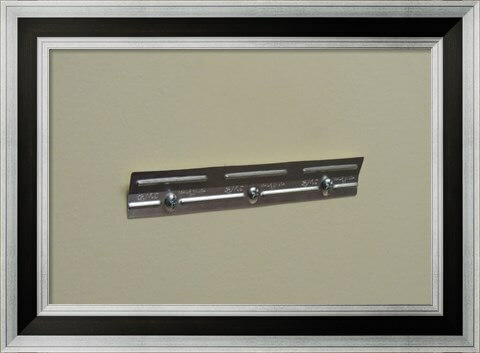 Now that the bracket is secure on the wall, you are ready to hang the frame. The bracket that is attached to the frame should have the elevated part faced out and down. Take the frame and face the back of it towards the wall and the piece with the bracket on top. 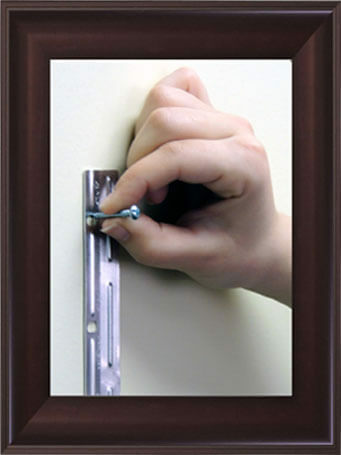 Place the bracket attached to the frame on top of the bracket you fastened into the wall. These two pieces should fit perfectly into each other. Your framed piece is finally hung and ready to show off!! 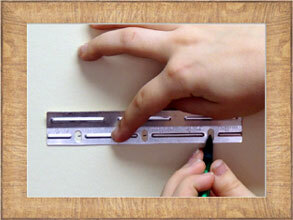 To see a step by step tutorial on how to hang canvas art, click here. Framed artwork ordered from UrbanLoftArt.com comes with a 100% satisfaction guarantee. If your item arrives damaged or it does not meet your needs, contact our friendly customer service team at 1-888-601-0010 or support@UrbanLoftArt.com. To see all of the details for our satisfaction policy visit our Satisfaction Policy page.